Spectacular views of Gibraltar, Africa and the glorious Mediterranean sea. Opposite the beautiful Port of Estepona on the western Costa del Sol, 5 minutes walk to beach and 15 minutes to an array of restaurants and shops in Estepona town. Air conditioned/heated, 2 bedroom apartment, 7th floor views, with small balcony overlooking the sea, huge communal pool and tennis court, not on a holiday complex. The lounge and both bedrooms have a sea view. Numerous Golf Clubs in the close vicinity. After living in Estepona and holidaying there for the past 30 years I never fail to enjoy the Spanish way of life. Now living in Dorset with a Farmhouse B&B, 4 self-catering apartments, a small campsite, pet pigs, alpacas, miniature Shetland ponies and loads of other pets to look after it's difficult to get away. All properties have spectacular sea views - come and visit. 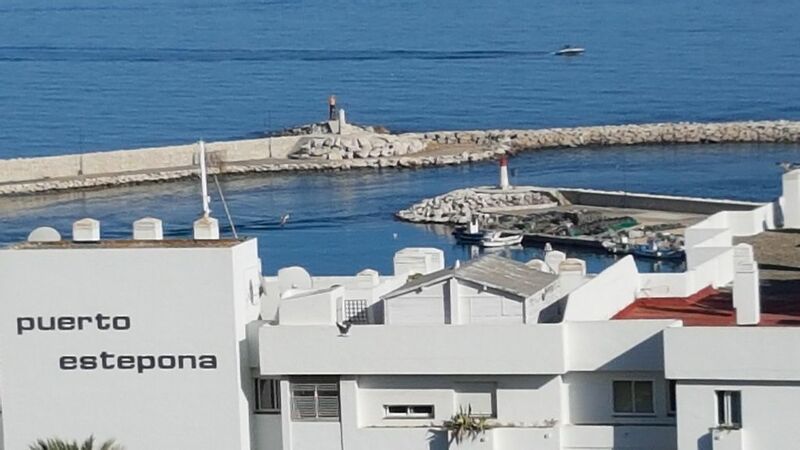 The apartment in Estepona with fabulous sea views of Gibraltar and Africa on a clear day, is available year round and enjoys a warm climate in the winter months. The area is still very Spanish. Evening walks into the town to dine at the local restaurants are a superb way to experience real Spain. Across the road from the apartment is the Port of Estepona to the left and to the right Playa Cristo a lovely safe cove. The beautiful towns of Ronda, Sevilla & Granada are just a few hours drive away. The Estepona Palace Hotel is just a 10 minute walk from the apartment in the direction of Gibraltar, where there is entertainment during peak season and free WiFi, just buy a drink and take the receipt to get the access code for the WiFi from reception. There is a bus which leaves Malaga Airport at regular intervals which is very economical and there is just one change at Fuengirola or Marbella for the Estepona bus. Car hire is available from many companies but we recommend Poolerentacar, an English company who will collect you from the airport and take you to their office nearby, so no queuing at the airport for a car. My English friends Kay and Clive will meet you at the apartment with keys and information. Air conditioning in lounge and both bedrooms rarely needed as bedrooms have ceiling fans. The apartment benefits from sea breeze so is rarely too hot. The air con units are also heaters. Lounge with sofas, dining table and chairs and TV (UK channels, ITV, BBC, Sports, etc). The lounge/dining area has an extending dining table and chairs. The small balcony has a marble table and chairs with beautiful views of Gibraltar and Africa, the Port and the fishing boats. There is a well tended communal garden. Pool, tennis court and garden keys are hanging on the hallway wall. Small balcony overlooking Estepona Port, Gibraltar and Africa on a fine day! Sierra Nevada Ski Resort approximately 2 hours drive. Free tennis court on site but no raquet or ball hire so bring your own! Excellent golfing. Over 50 golf courses along the Costa del Sol. Estepona Golf Course quite challenging, special deals, twilight etc. Welcoming English staff. Less than 2 miles away. 9 hole course also in Estepona. Keys to gardens, tennis courts and swimming pool are located inside apartment hanging on hallway wall. Please take care to replace them on departure. Notes on accommodation: The apartment has a small balcony overlooking the sea and pool. It has air conditioning/heating. The lounge and both bedrooms have a sea view. There is a baby gate for the balcony. There is a lift to the front door. Outside: Well tended communal gardens and extremely large shared pool. Balcony overlooks the sea, newly resurfaced tennis court and pool. Newly resurfaced roads and pavements. Cleaning / Towels / Linen Towels and linen included, changed weekly. Beach towels not included. Property cleaned weekly. Playa Cristo Cove across the road just a few minutes' walk with excellent shower facilities and two beach bars, music, etc. Main Estepona Beach approximately 10 minutes' easy walk. Public bus leaves Malaga Airport regularly. Change at Fuengirola or Marbella for Estepona. Seville, Granada, Sierra Nevada approx 2 hour drive. Ronda, Malaga approx 1 hour drive. Puerto Banus and Marbella 20-30 minutes. The nearby attractions include the Selwo Safari Park on the outskirts of Estepona, an equestrian centre with Andalucian horse displays, an amazing botanical Orquidarium in Estepona town, a Sunday market across the road in the Port, waterskiing, cycling, tennis, horse-riding, bowling, walking and above all, year round golf! For those wanting to explore further, an amazing 1 hour drive through the mountains will take you inland to the historic sights of Ronda or a 2/3 hour drive to the exciting cities of Granada, Cordoba or Seville. During the winter months there is excellent skiing at the Sierra Nevada Ski Resort near Granada. The new road structure now in place along the coast means that Tarifa and the golden beaches of the Atlantic are easily accessible within 1 hour. The jet setters paradise of Puerto Banus is a short drive, around 15 minutes, along the coast towards Malaga.